With oversized, tropical-looking leaves and bizarre seed pods, castor bean is an exotic addition to the ornamental garden. 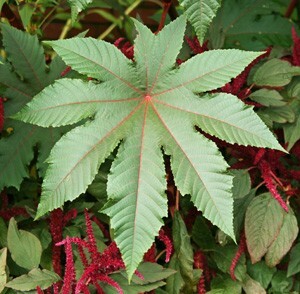 The only member of the genus, Ricinus communis is in the Spurge Family (Euphorbiaceae). The word ricinus is Latin for “tick”, used for this plant name because of the superficial resemblance of the seeds to a particular species of European tick. Castor bean is native to tropical east Africa around Ethiopia, but has naturalized in tropical and subtropical areas around the world to become a weed in many places, including the southwestern U.S. Plants are typically found in moist, well-drained soils in disturbed areas, such as along river beds and roadsides, and in fallow fields or at the edges of cultivated lands. Castor bean is an evergreen herbaceous or semi-woody large shrub or small tree. This robust tender perennial can grow to 40 feet tall, developing woody stems over a few years in frost-free climates. Because of its rapid, vigorous growth, it is easily grown as a warm season annual in temperate climates, but it rarely exceeds 6-10 feet in a single growing season. This fast growing plant tends to grow straight up at first, developing branches later in the season to form a well-proportioned shrub with sturdy stems and a dense canopy. The plant is killed when the temperature drops below 32F. Unlike many members of the euphorbia family, this plant does not have milky latex sap, but has a watery sap. The alternate, star-shaped leaves on long petioles can grow over 2½ feet across. Each palmate leaf has 5 to11 deeply incised lobes, with serrated edges and prominent central veins. The species has glossy green leaves, but cultivated selections may have black-purplish, dark red-metallic, bronze-green, or maroon leaves, or bright green leaves with white veins. Flowers are produced in dense inflorescences 8-18″ tall at the tops of the stems. The monoecious plants produce male flowers below the terminal female flowers. The flowers do not have petals and are not particularly showy. The ½ inch male flowers each have a cluster of many cream or yellow stamens that shed large amounts of wind-borne pollen. They senesce soon after shedding their pollen. The three conspicuous, star-shaped stigma lobes of the female flowers are bright red with feathery branches. The small male flowers are produced below the more conspicuous terminal female flowers. The little spiny ovary of the female flower develops into a fruit or seed capsule about the size of a golf ball after pollination. The seed pods may be green, pink, or red (depending on the variety), but gradually age to brown. Each spherical, seed capsule is thickly covered with soft flexible spines and has three sections that separate when the seeds are mature. Each section contains one seed that is ejected, often with considerable force, when the carpel splits open. The spiny seed pods may be green (L), pink or red (C), but eventually turn brown and split open when ripe (R). The ½ inch long seeds, or “beans” (they are not true beans), are produced in large numbers where the growing season is long enough (140 to 180 days). 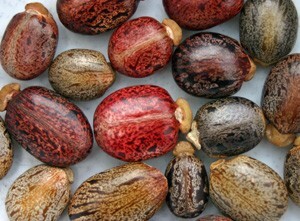 The shiny, intricately mottled seeds are quite attractive, each with their own unique design in colors of black, gray, brown, yellow-brown, maroon and white. spongy caruncle at one end. Each seed has a small, spongy caruncle at one end which helps absorb water for germination when planted. Seeds remain viable for 2-3 years. About half the weight of the seed is a thick, yellowish or almost colorless oil that has been used in many industrial applications. The oil was used in ancient times as fuel for lamps, and is now used in paints and varnishes, for water-resistant coatings, in high-performance motor oils, soap, inks, and plastics. Other derivatives are used in polishes, as solid lubricants, in synthetic perfumes and other products. Plants are grown commercially for oil production primarily in India and Brazil, but also in some parts of the U.S. and other countries. The seeds are extremely poisonous, so keep plants out of reach of children (or trim off flowering spike if this is a concern). The toxin in castor seeds is ricin (RYE-sin), one of the deadliest natural poisons, estimated as 6,000 times more poisonous than cyanide and 12,000 times more poisonous than rattlesnake venom. As few as four seeds can kill an average-sized adult, while ingestion of lesser amounts will result in vomiting, severe abdominal pain, diarrhea, and convulsions. Livestock and poultry can also be affected if they consume seeds or meal from the seeds. Although it is a very potent poison, ricin has been investigated as an anti-cancer agent. Ricin is water soluble, not lipid (oil) soluble, so it is not released during the pressing process, remaining in the leftover “seed cake.” This residue is used as a high-nitrogen fertilizer, or after detoxicating, the meal can be used as livestock feed. Since the toxin does not occur in the pure oil, castor oil can be consumed and has been used medicinally as a remedy for everything from constipation to heartburn. It is an effective cathartic or purgative (laxative) and can be used externally as an emollient for dry skin. 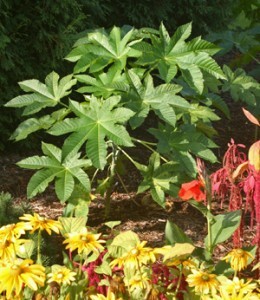 When grown as an ornamental, castor bean can be planted directly in the garden in late spring, or started indoors earlier (6-8 weeks before the average last frost) and transplanted outdoors when the weather warms. Nick or scarify the seeds or soak overnight for better germination. Sow the seeds 1-1½ inches deep. Seedlings should start coming up in 1-3 weeks. The young plants grow quite quickly and may need repotting into larger containers before transplanting outdoors. Place the plants outdoors in full sun and deep, rich soil about 4 feet apart. Provide plenty of water and fertilizer to achieve the largest size. Once established it can tolerate drought. Wind can shred the leaves, so they should be placed in a protected spot if possible. Plants can be pruned to limit the size, or may need staking if top heavy; otherwise this plant needs very little maintenance. 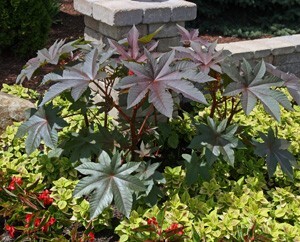 Castor bean has few pests, although spider mites can sometimes be a problem in hot, dry weather. The large seeds germinate in 1-3 weeks (L) with smooth cotyledons (C) that do not resemble the true leaves that are soon produced on the seedlings (R). addition to the ornamental garden. 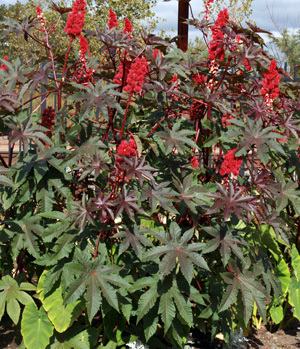 With its large leaves and tall stature, castor bean makes a bold statement in the garden. The coarse texture contrasts well with finely textured plants. Grow castor bean as a specimen for a dramatic focal point in the landscape, or in groups for a tropical effect in the back of beds or near water features. It can be used to create a temporary screen or informal hedge or can be grown in large containers on patios. Castor bean combines well with cannas, bananas and elephant ears for a tropical garden. Or use it as a backdrop for grasses and other large-scaled annuals for a more traditional look. ‘Carmencita Bright Red’ – has red stems and bright red seed pods, along with dark purplish or bronzy-red leaves. This well-branched cultivar grows about 5-6 feet tall. ‘Carmencita Pink’ – has pinkish-red stems and seed pods. ‘Carmencita Rose’ – has blue-green foliage and peach-colored seed pods. 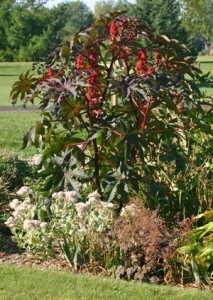 ‘Gibsonii’ – with dark red-tinged leaves and pinkish seed pods, it grows 4-5 feet tall. ‘Impala’ – a more compact cultivar that grows to 4 feet tall with reddish-purple leaves and stems, with the brightest color on the new growth. 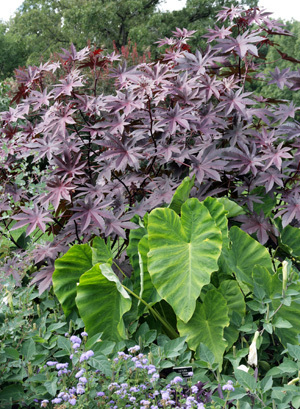 ‘New Zealand purple’ – has smaller, reddish purple leaves and branches less than other types. ‘Red Spire’ – grows 7-10 feet tall, with red stems, bronze leaves, and red seed pods. ‘Sanguineus’ – has blood-red stems and leaves. ‘Zanzibarensis’ – another tall variety (7-10 feet) with green leaves with white midribs. My friend’s 4 year old dog just died from eating a seed that dropped into a friend’s backyard. The plant did not grow in the friend’s yard, but was growing wild in an open lot behind her house. Her other two dogs became very ill, but, after several days in a veterinary hospital, are recovering. She is heartbroken. Given how potentially deadly this plant is, why would you encourage anyone to plant it? I live in Southeast Missouri. Was at a fgriends rural home and they has these plants along a back fence row and they looked awesome. They gave me a bag of beans which I’m planning to do the same. NOW I’v read and have seen pictures where thy are planted with Elephant Ears and other lower growing plants in beds or near a patio and they can be pruned. Question: How are they pruned? Do you just top them when they reach the desired height or what? I am considering planting castor beans next spring, but am wondering about the large stalks on these plants. I live in southwest Missouri, so they will grow as annuals. Do the stalks need cut or pulled up out of the dirt? I have a beautiful slope in my side yard that castor bean plants would look lovely on. i just don’t want there to be a lot of struggle to get rid of the “old”. I lived in Maryland and now Colorado. In both areas, I had to dig the stalks up. I’ve found it easier to wait until the spring time to do. Giving the winter time to help break down the stalk and roots becoming compost. I’ve been planting these seeds for over 10 years. Each year the grown was richer. Digging up stalks is a must. I start them indoors in a greenhouse or garage around Feb/March. Repot, as necessary, and move outdoors after last frost. I’m in Texas.